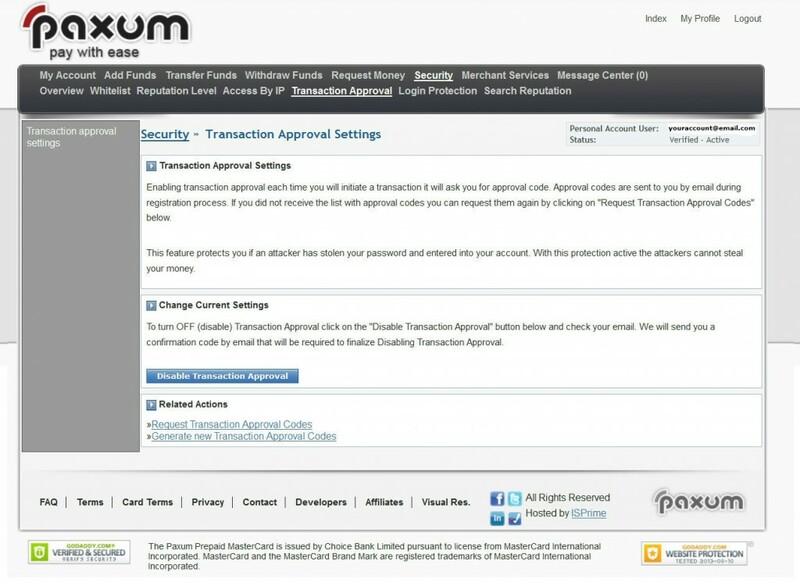 Transaction Approval Codes are enabled by default and so after you register and verify your Paxum Account you will be automatically emailed a PDF file containing your unique Transaction Approval Codes. What are Transaction Approval Codes? 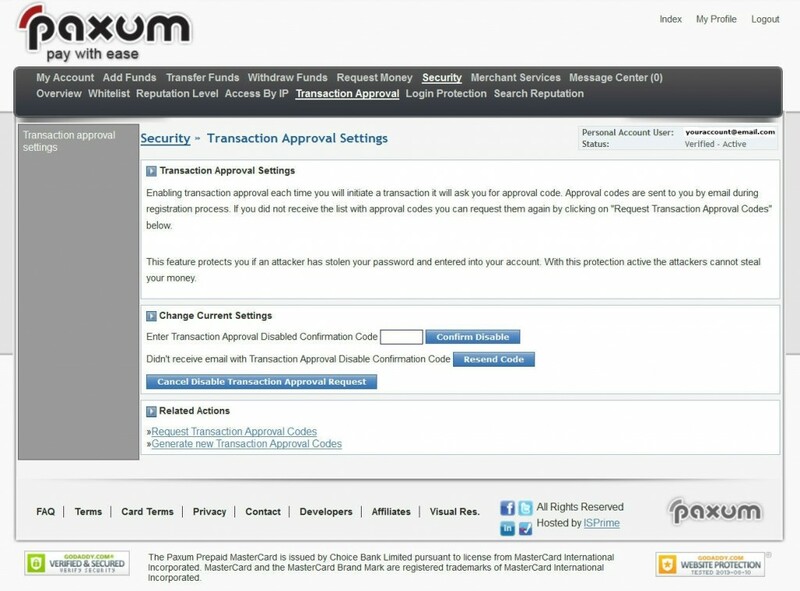 Transaction Approval Codes are an optional security feature that helps protect against unauthorized use of your Paxum Account. With Transaction Approval Codes enabled, every time a transaction is attempted, a Transaction Approval Code will be required in order to complete the transaction. 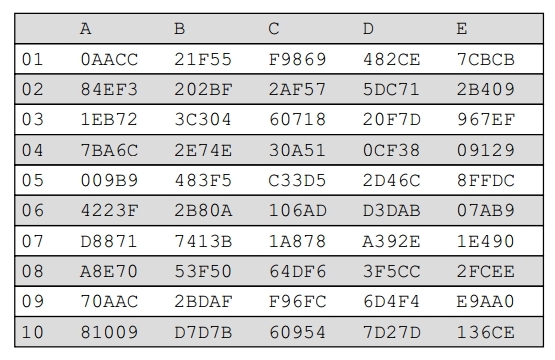 When a Transaction Approval Code is requested you will be asked to provide the code from a certain spot on the grid, for example in the grid above if you were asked for the code located at Column B Row 04 then you would enter 2E74E in order to proceed. Why Should I Use Transaction Approval Codes? If your Paxum Account is ever compromised, hacked, or accessed without authorization, having Transaction Approval Codes enabled will ensure that the unauthorized user is unable to complete any transactions such as transferring money to other account-holders. This helps to prevent your hard-earned funds from being stolen. What if I lose them? 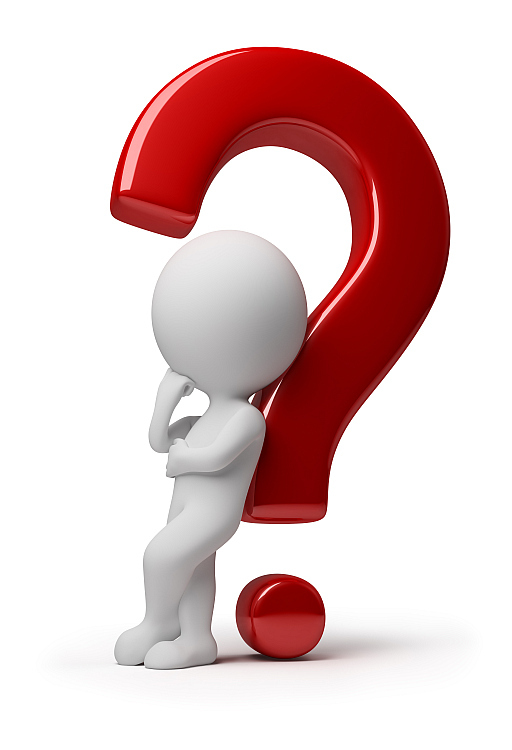 How Can I Reset My Transaction Approval Codes? 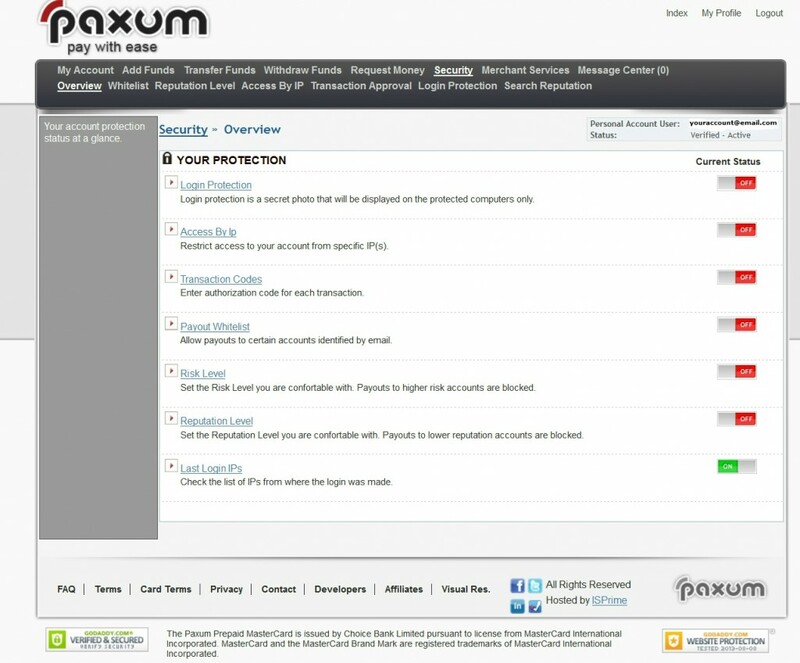 Should you ever lose your Transaction Approval Codes, or if they stop working properly you can easily reset them instantly from within your Paxum Account Control Panel. Simply login to your account and click Security in the top menu. Next click Transaction Codes from the menu on the Security page. the previously issued codes will no longer work. How Can I Disable Transaction Approval Codes? We recommend using Transaction Approval Codes, however we do recognize that some Paxum account-holders may not wish to use this feature. Now check your email for the Disable Code. It will arrive almost instantly, and the code is contained within the body of the email. As you can see there is now an open box where you can enter your Disable Code. If you did not receive your disable code you can also click to request it be sent again. After the Disable Code is entered Transaction Approval Codes will be disabled for your account. Please note, if at any time you wish to re-enable Transaction Approval Codes you can easily do this by simply visiting this section of your account again and clicking the Enable Transaction Approval Codes button. We hope this Guide to Paxum’s Transaction Approval Codes has been of help to you. You’ll find lots of other useful information here on the Paxum Blog. Explore our pages to make the most out of your Paxum account!